What a change of weather and temperatures in those first two weeks of Advent ! Snow fell – a little – and left. 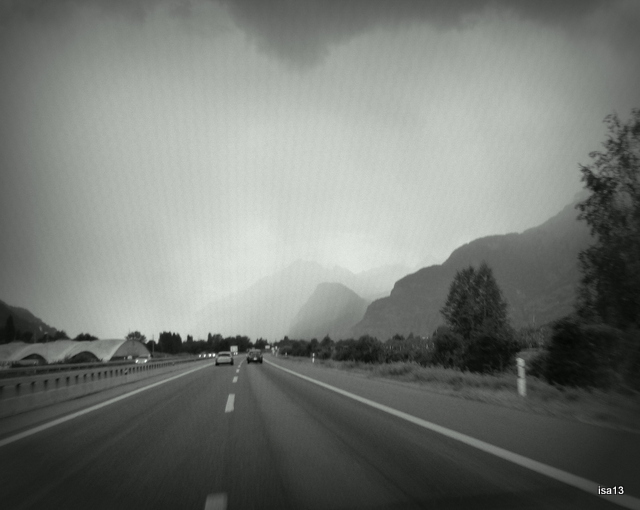 It was followed by rather dull and foggy days . Then we got rain, lots of it, although the mood of the Season is here : red colors. Crisp, cold days, trees decorated in red or were they goblins’ tall hats ? A lot of red also in the window shops, fa sho’ ! Red but frozen, a forgotten heart in a pot on the terrace. Forgotten but not broken ! Outside the air is cold, a few leaves are still blooming in the late afternoon sun. But inside, a hot and spiced Christmas pot of tea awaits you for a quiet moment in the warm shades of candlelight. And… a cake too, if you feel like it. A lemon scented cake. Happy Advent’s time to you all, Friends, wherever you are. …our weather has obviously been changing. 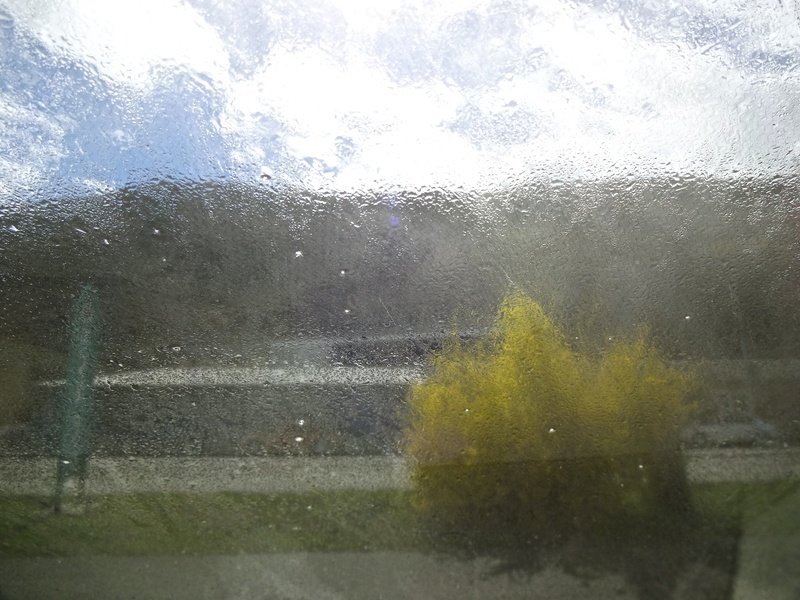 Although we still get to see a bright blue sky during the day, temperatures have dropped. 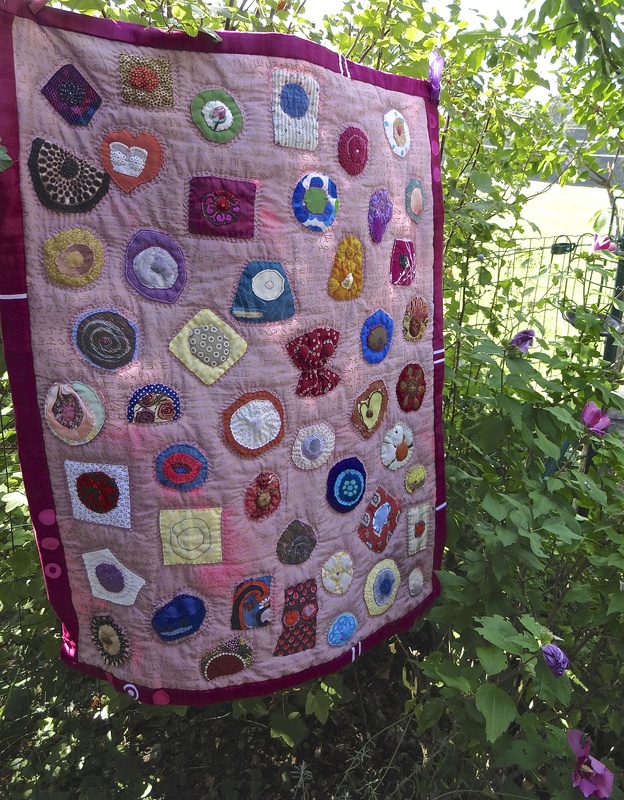 Evenings and nights are cooler, quilts are welcome ! 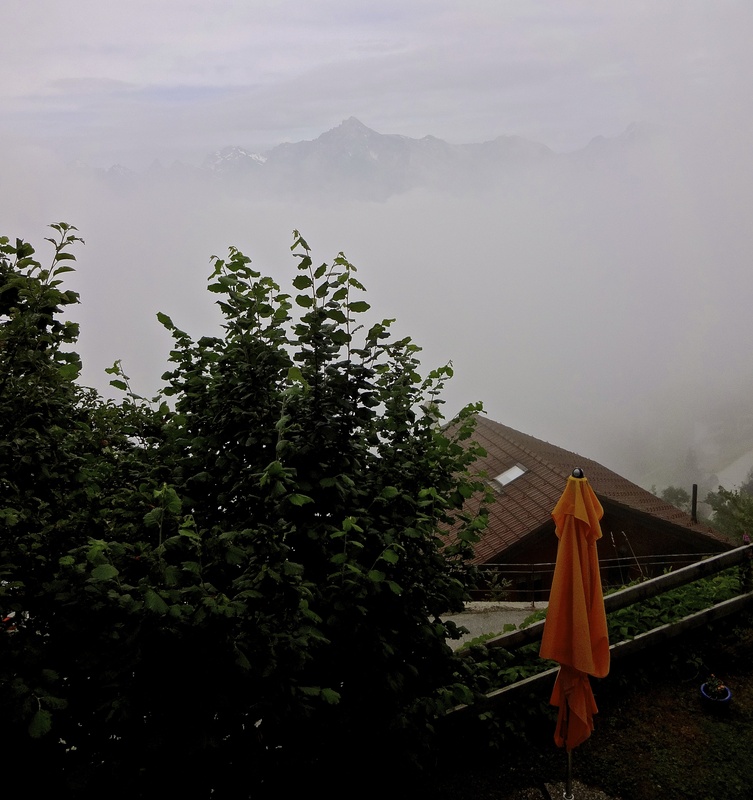 Mountains are often hidden behind a morning mist and parasols stay closed, a colorful reminder of our sunny Summer. Rain has fallen. Humidity was so much needed and no one is complaining. 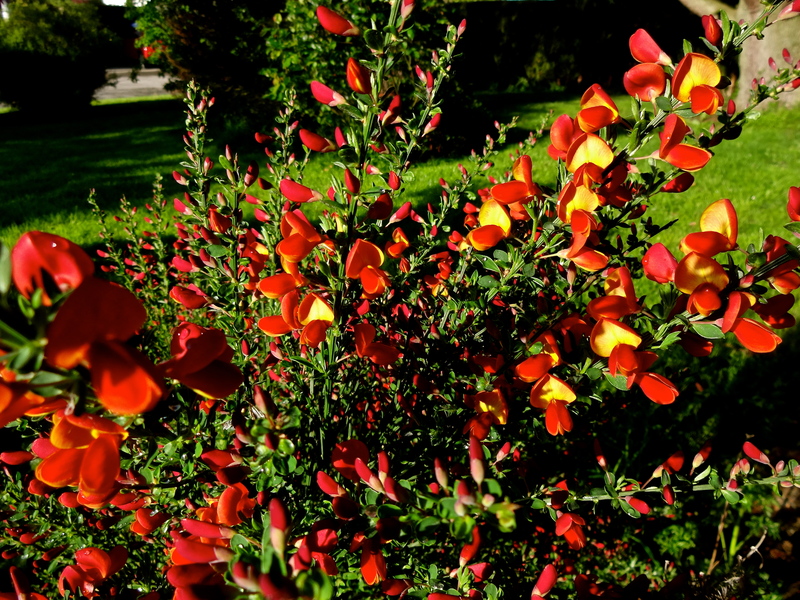 There are still some flamboyant colors left in the garden, like this red/orange gorse or broom ? that are brightening up any day. On a clear day at the lakeside, you could even meet The Lady of The Lake (not even feeling cold 😉 enjoying the late Summer sunshine. In town, Fall and Winter clothes are blooming in the shop-windows. A little dog is sitting outside; he looks at the passersby as if saying : “Here is the new Fall fashion for you, ladies”. 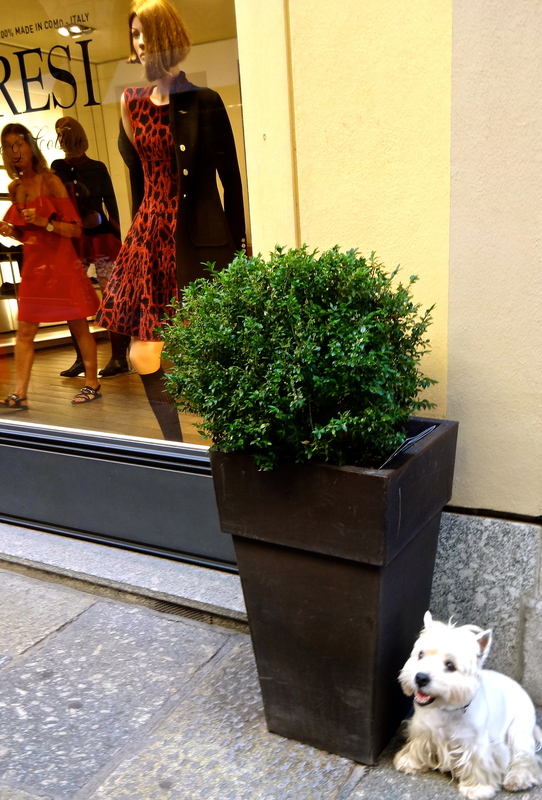 A nice encounter with this irrresistible and patient doggie waiting for her owner who went inside the boutique. For how long ? Who knows ? He will wait for sure. On the way to the forest, I made another encounter that attracted my attention. A small yellow leaf was caught in a late afternoon sunray and shone in all its glory. Could this be another sign of Autumn settling down around here ? Ninio has felt something too and is trying to blend in. Hunting season has started, his instinct for camouflage is awoken but I keep him on a leash…so as to be sure we walk back home together ! And avoid trouble with the hunters. Wishing you all a happy, healthy and colorful Autumn. 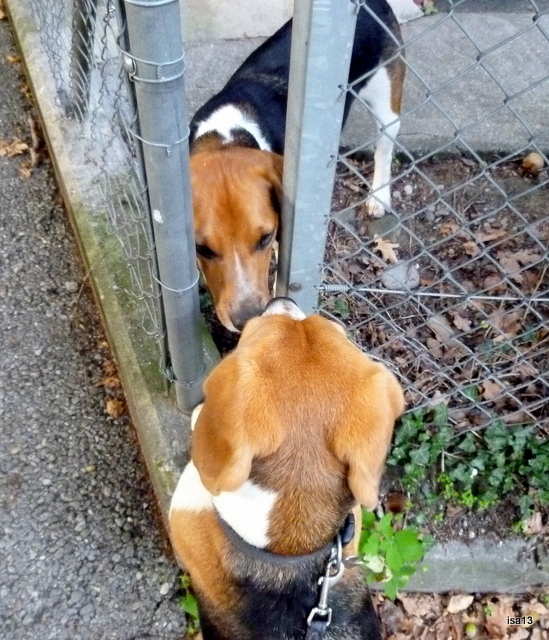 … GETTING unexpected news from friends you thought had all forgotten about you. But they did not ! An SMS on your cellphone, a letter with lots of pictures, a telephone call, all of it on your birthday. … LISTENING to a song from years ago by a lady who was famous as an actress, a singer, an activist and a politician (Minister for Culture in her country). A beautiful unforgettable human being, MELINA MERCOURI, from Greece. … WALKING to the woods just after the rain has fallen, droplets of water still trembling on the branches and leaves. I am listening to the rain whose drops are falling one by one. I am listening to the rain whose noise is calming my heart. … IMAGINING things in the sky, like a large lost feather… or an angel’s wing ? … And last but not least ENJOYING POSTING AGAIN, reading you, finding inspiration, energy and time to write to you ! I feel sure there are many other reasons to define what HAPPINESS is. Those are just the thoughts that came to mind as I started writing about it. Some weeks just go by their own quiet way and rhythm. I do not mean a routine because there seems to be something special in each day. In some weeks though there are events out of the ordinary, people and places you will remember. The week described here was one of those. Monday is sometimes a day when I try cooking new recipes. Pies or quiches are amongst my favourites. Some of them I find reading blogs such as Tammy’s. 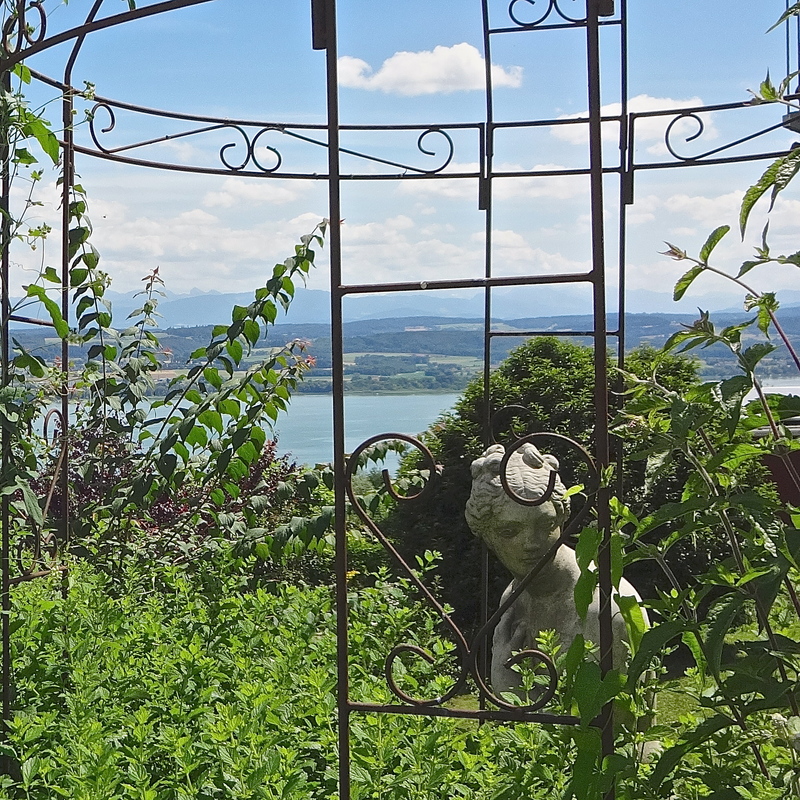 Her blog is not only about food but also about community supported agriculture. Well worth reading. 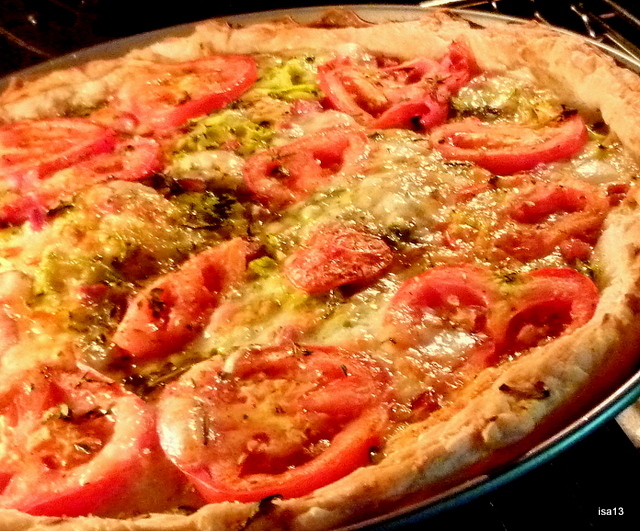 The recipe is about a tomato pie. Since I had a big and beautiful zuchini waiting to be picked in the garden, I added some of it in the pie (grated and grilled a little). This is the only change I made. It tasted really delicious, Thank you very much, Tammy. Wednesday morning. 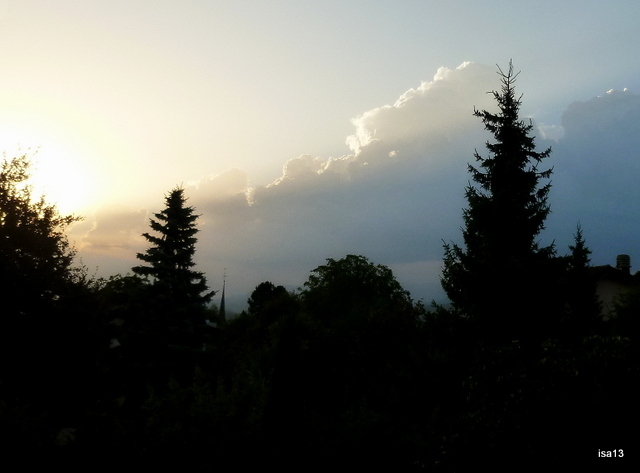 Brilliant clouds welcomed me as I opened the shutters. “O, beautiful golden clouds, what will you bring us on this day” ? As it happened, the warm morning turned into a stormy day. A rather temperamental weather this Summer but a rain that was well needed too. A short break after work on Thursday afternoon. As we were sitting on a bench with a friend, a “school-boat” was floating down the canal. 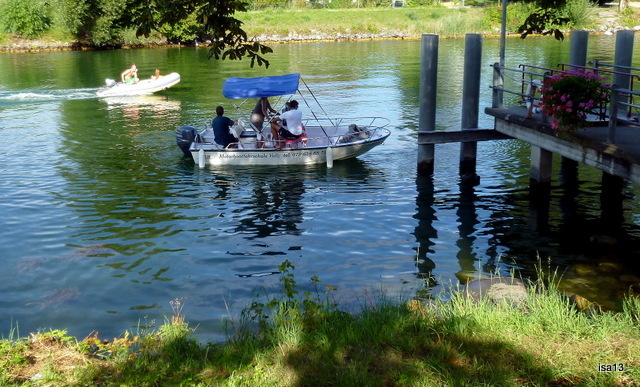 A lady was steering the little boat back to its mooring. Not as simple as it looks and she did very well. Friday was a rainy day. A drive over the mountains to visit long-time friends of our family. It was cold, foggy. The landscape looked autumnal and yet beautiful in its own way. On Saturday morning at our friend’s home, we were awaken by a ballet of helicopters. 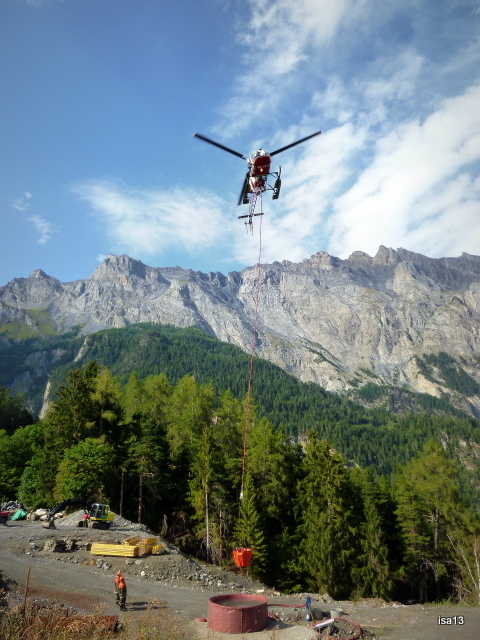 Every third minute or so, a helicopter would fly over the area, fill a big bucket of water (700 liters) and pour it down on the forest which had caught fire during the night. It took the pilots two whole days to stop it. Nobody was injured and the damage could be stopped in time. Sunday was a happy celebration day ! Family and friends gathered around Alima, our youngest niece. The sun shone brightly for her. There were prayers, songs, dance and lots of African food and music. Another change of scenery in this particular week. 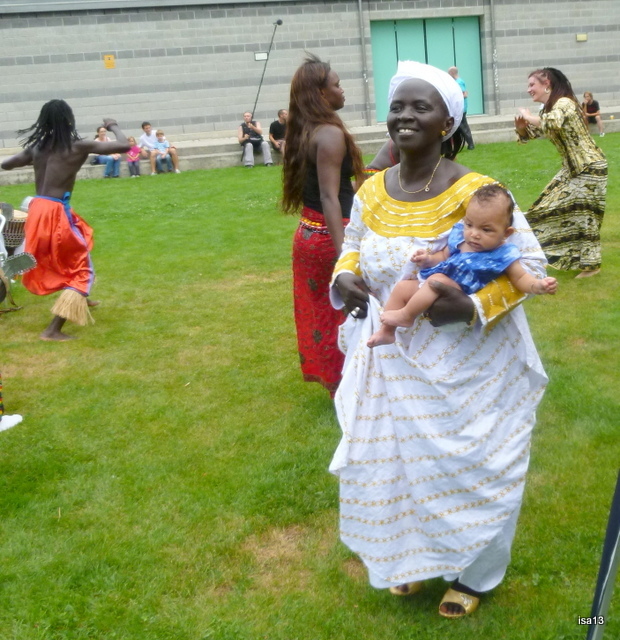 Alima was quite comfortable and relaxed dancing in her proud grandmother’s arms. Guess what I did on Sunday ? 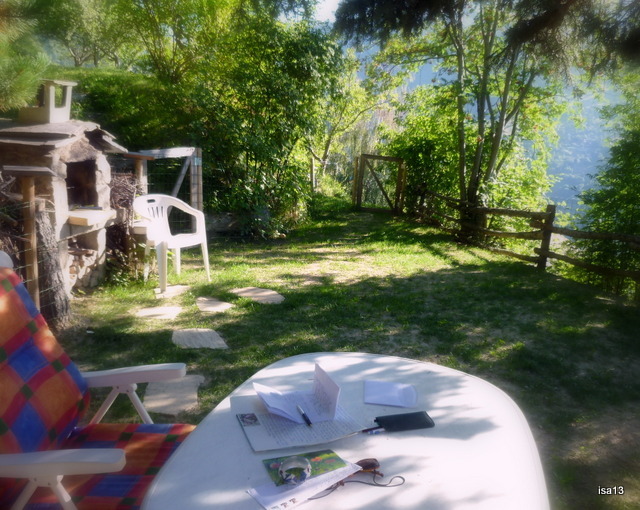 After a rest following the previous long day, I sat down on a lovely terrace between sky and earth, took my pen and some nice stationary; I wrote to a dear friend all about my recent week. Internet is not part of her world and we both enjoy exchanging letters every month.